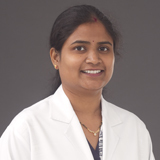 Dr. Sriveni Sana has obtained her MBBS from Kamineni institute of Medical sciences, Hyderabad and MD(Radiology)from Mamata Medical college, Khammam, Telangana, India. Dr. Sriveni has mor e than 6 years’ experience in the field of radiology, well versed with all imaging modalities including USG, Doppler, CT and MRI with special interest on women's imaging. Dr. Sriveni is specially trained in breast imaging and interventions from Chennai breast center. She worked as a consultant radiologist at Vijaya diagnostics,hyderabad followed by Usha Mullapudi Cardiac Centre and Lucid Medical diagnostics, Hyderabad. Dr. Sriveni was awarded with Kamineni Shashidhar Gold Medal in Final MBBS-II,Certificate of Excellence and Silver Medal for outstanding performance in MD exam at NTR UHS Silver Jubilee celebrations, Vijayawada and Certificate of Merit and Gold Medal for securing highest marks in MD Exam by Mamata Educational Society. Dr. Sriveni is a Life Member of Indian Radiological and Imaging Association and Indian medical association. She has attended many courses and workshops with poster, paper presentations at conferences. She is fluent in English, Hindi and Telugu.